Happy Monday to you! This week’s moodboard is based on some of my favourite bloggers and a neutral palette. This picture is from one of my favourite bloggers, Alice Catherine. I love the beautiful clothes she wears, a hint of vintage paired with modern pieces. 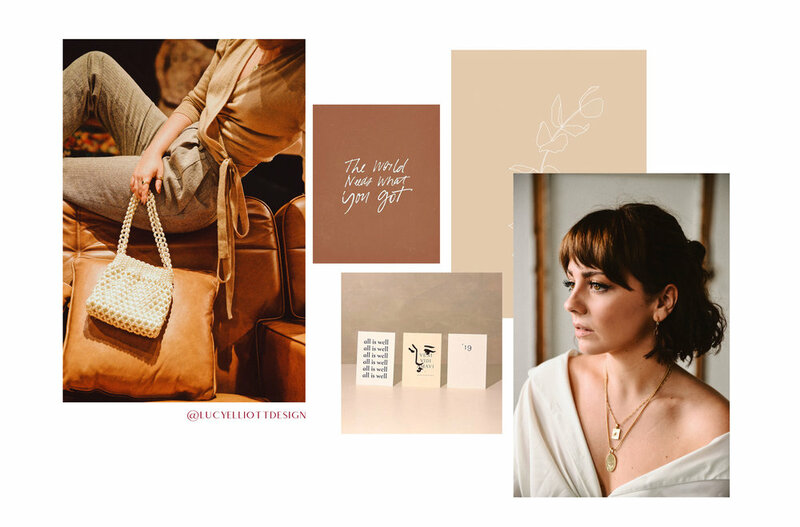 Her Instagram feed has a strong brand identity and she loves playing around with different textures and gold jewellery. ‘The world needs what you got’. What a great sentiment. I am loving this signature-style font at the moment. I think there’s something so effortless about it, yet it’s still legible. This design is from Tanya Val. Peeping behind is a beautiful little illustration of some leaves. The thin lines hear are beautiful against the beige. This illustration is from Alannah Kiarah. Alice Catherine appearing again. Very much #stylegoals. This beautiful print series is from Studio 1850. I love the simplicity and the Matisse-inspired line drawing. The serif font and the texture of the background lends this composition to a have a vintage feel.